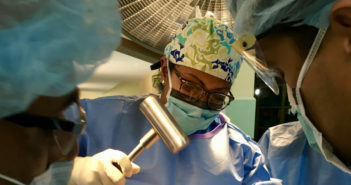 You are at:Home»Posts Tagged "Residents and Fellows"
Linda Suleiman, MD, ’17 GME, assistant professor of Orthopaedic Surgery, discusses her recent study on the representation of women in orthopaedic surgery. Michelle Byrne, MD, MPH, a resident in family medicine at the McGaw Medical Center of Northwestern University, was elected to the Board of Directors of the American Academy of Family Physicians. The presence of cancer cells in the bloodstream of patients with early-stage breast cancer may be predictive of benefit from radiotherapy after surgery, according to a new Northwestern Medicine study. Women who’ve previously experienced a heart attack are twice as likely to develop mental stress-induced ischemia compared to men with a similar history, according to a recent study. Students, residents, faculty and staff recently traveled to San Francisco to attend the Student National Medical Association annual conference for current and future underrepresented minority medical students. Over 430 scientists, trainees, students and faculty presented abstracts at Feinberg’s 14th Annual Lewis Landsberg Research Day, a celebration of the medical school’s innovative research and the dedicated investigators who make it happen. Northwestern’s Alpha Omega Alpha honor society chapter inducted 36 new members in a ceremony held at the University Club in downtown Chicago, counting students, residents, fellows and staff among the new inductees.